Explain Engage for Gmail and Outlook. Meet Alan Johnson. Alan is the Sales Manager at Get Cloudy Consulting, a high-tech consulting firm specializing in CRM implementations. Get Cloudy Consulting is growing rapidly, but it’s sometimes difficult for sales to keep up with the latest marketing messaging or keep track of their latest sales promos. Alan also wishes there was an easy way to help his team know when people are actually interacting with marketing content so they can reach out to the right people at the right time. Finally, he’d like to see what type of emails are resonating with leads and prospects over time. Sometimes Alan feels like the sales and marketing teams at Get Cloudy Consulting are on different planets, and he’s looking for ways to help his sales team stay aligned with all the latest and greatest campaigns marketing is putting together. Enter Leung Chen, Get Cloudy Consulting’s Marketing Manager and resident Pardot Admin. 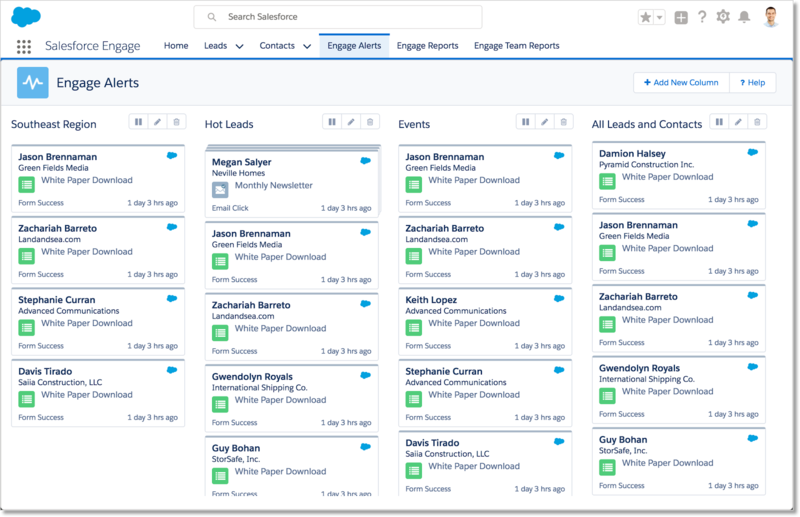 Leung recently implemented Pardot at the company (see the Automate Marketing to Businesses with Pardot trail to get the full story), and as part of the implementation Get Cloudy Consulting received a number of Salesforce Engage licenses that have yet to be activated. Leung is just starting to learn more about Salesforce Engage and thinks it might be the perfect solution for Alan’s sales and marketing woes. Let’s start with Engage Campaigns. With Engage Campaigns, Alan’s sales team will be able to quickly send marketing-approved, targeted emails to their leads and contacts directly from Salesforce. They’d be able to send emails to both individuals (1:1) and groups of leads and contacts via list views (1:many). Get Cloudy’s marketing team will also be able to lock down regions of the emails they create with email templates in order to make sure brand standards and legal disclaimers are met. 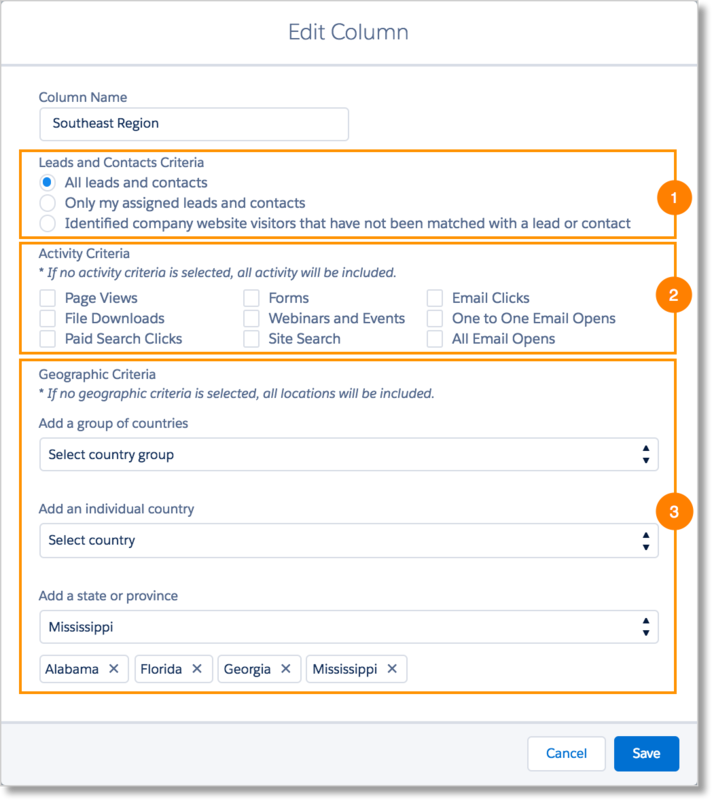 With the addition of Engage Campaign folders, users can browse the Pardot folder hierarchy or search for a template organized within folders while composing an email for quick access. They are able to view all templates marked for 1:1 emails in any folder they have permission to view. Thanks to Engage Campaigns, Alan will be sure his team is delivering the right message, every time. Next is Engage Alerts. Engage Alerts is a real-time service that displays lead and contact activity from the past four days in an easy to digest card-based view. This means that Alan’s team will know exactly when people are interacting with their marketing content thanks to alerts in Salesforce, Salesforce for iOS and Android, or the Salesforce Engage desktop app. To get even more information about a lead or prospect, simply click a card. 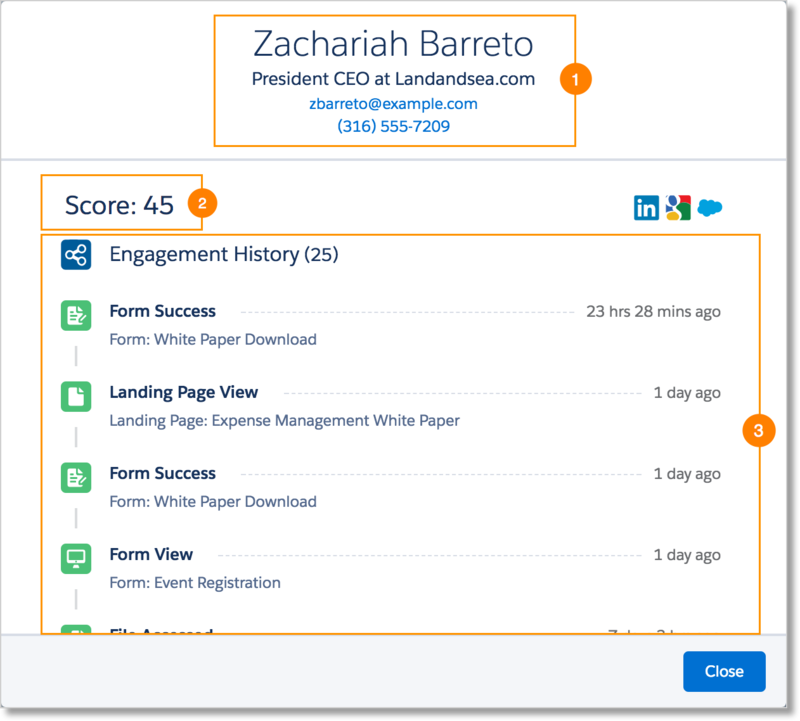 The card will provide contact information (1), show their Pardot score (2), and display their engagement history with the latest activities at the top (3). Alan’s team will even be able to filter alerts based on the following filter criteria: Leads and Contacts Criteria (1), Activity Criteria (2), and Geographic Criteria (3). Some filters, such as filtering by a salesperson’s leads and contacts, come predefined. But his team will also be able to combine filter criteria to create more complex filters such as a salesperson’s leads and contacts by region. Then there’s Engage Reports. 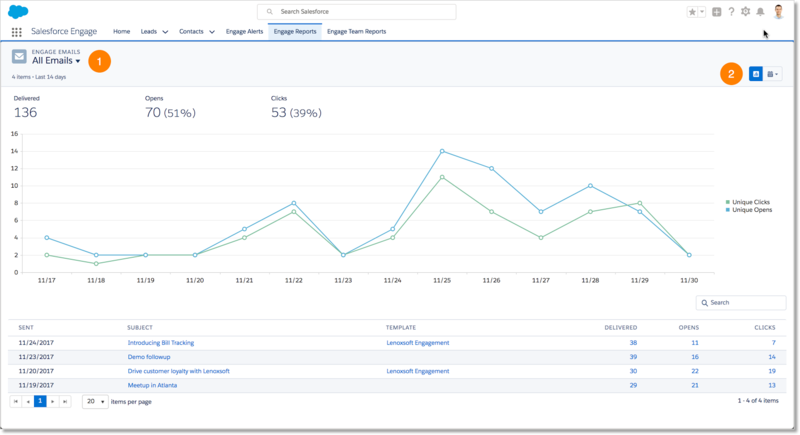 Engage Reports can be accessed from the Engage Reports tab in Salesforce and will give Alan’s sales team insight into which Engage Campaigns are performing well and which ones might need some help. One glance and his team will know exactly what content is resonating with leads and contacts. The reports can be filtered by All Emails, Templated Emails, or Non-Templated Emails, which means they’ll be able to track the effectiveness of each type of email (1). If they want to see how the emails are performing over time, they can also filter reports by the last week, last two weeks, last 30 days or by selecting a custom date range (2). 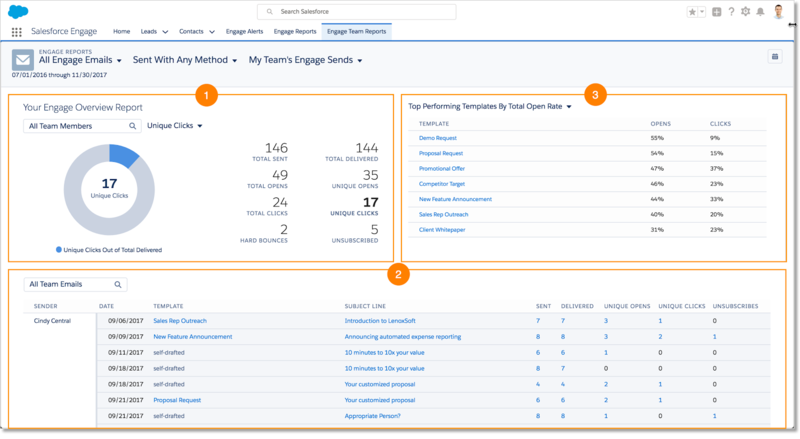 Engage Team Reports will also allow Alan to report on the team’s overall Engage email usage and impact. 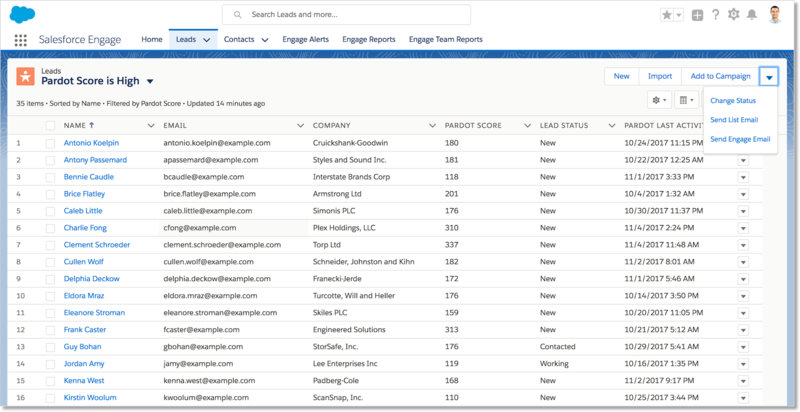 With Team Reports, he’ll be able to view aggregated stats on emails (1), drill down and compare metrics for individual sales reps (2), and identify the team’s top performing templates by email opens and clicks (3). Finally, there’s Engage for Gmail and Engage for Outlook. 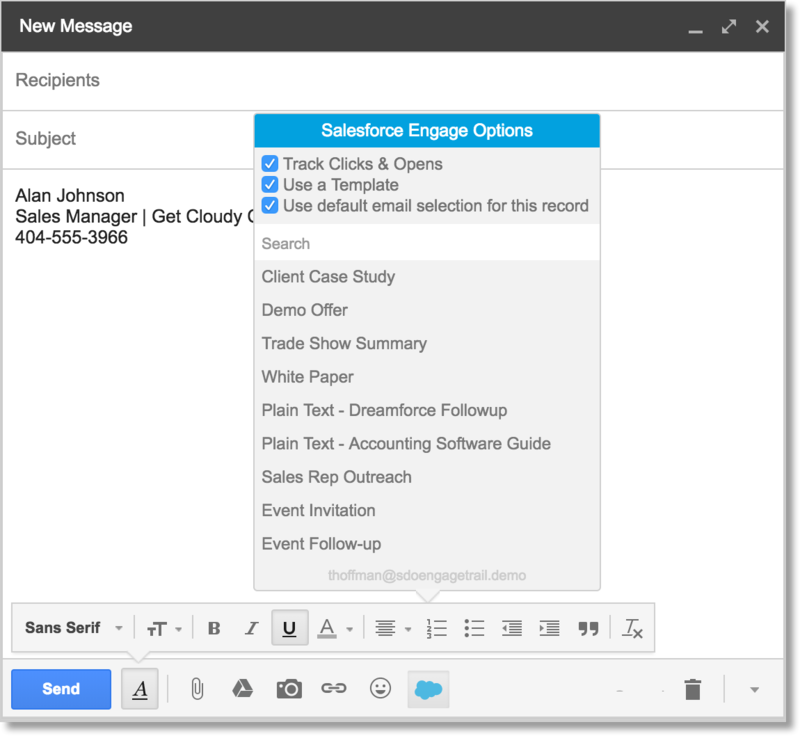 With the Salesforce Engage for Gmail extension, Alan’s sales team will be able to send tracked templated or non-templated one-to-one emails directly from their Gmail accounts. They will also be able to add and remove prospects directly to and from lists by clicking the Add to Nurture button in the Gmail side panel. Available name, company title, address, and phone number for participants. Score and grade for the corresponding Pardot prospect. Whether the record is a lead or contact. The prospect's recent marketing actions. 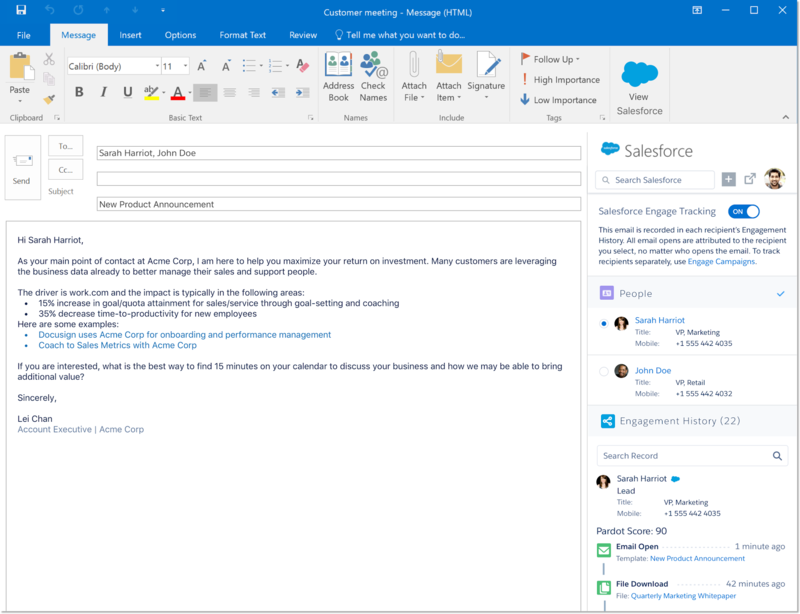 Like Engage for Gmail, Engage for Outlook is a Microsoft Outlook extension that will let Alan’s team send trackable 1:1 emails and view their prospect’s Engagement History directly in Outlook. They can then track opens and sends to give further insight into how their prospects are engaging with their emails. After some more investigating, Leung is convinced that Salesforce Engage is the solution that Alan and his sales team are looking for. The next day she meets with Alan and describes how Salesforce Engage can help his team by giving them access to marketing-approved templates, alerting reps when people engage with their marketing content, and providing greater insight into what type of email content is most effective over time. Thanks to Salesforce Engage, aligning Sales and Marketing may not be that big of a mystery after all.